Remember the passing explosion to start the NFL season last year? Get ready for even more. 2011 was not a one-year blip but instead was part of an accelerating trend toward more potent and more frequent passing. This isn't statistical trivia either, as this trend has dramatic implications for how the game should be played. Take a look at Adjusted Net Yards Per Attempt (courtesy of PFR), which with just one number incorporates passing efficiency, interceptions, and sacks. Since the dawn of the modern passing era, passing has become steadily more lucrative. But since 2004, the rate of increase in average ANY/A has accelerated. The 2011 season featured the most successful passing game ever. The risks associated with passing are declining as well. 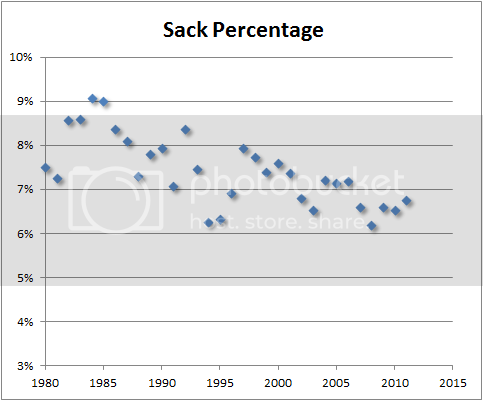 Sack percentage is declining and becoming less variable from season to season. 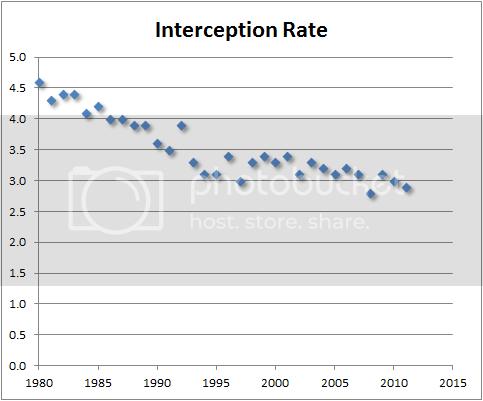 Interception rate is also steadily declining. These trends mean that, yes, the trite notions that today's football is a passing game and the NFL is a quarterback's league are undeniably true. It's been that way since the days of Joe Montana. The more important implication is that the game should be played very differently than conventional wisdom traditionally dictates. First, offenses should be passing much more often than they do. The league's run pass balance should probably be closer to 15% run 85% pass than the 40/60 split it's been in recent years. It's impossible to know the optimum league-wide ratio until teams start pushing toward the true equilibrium, but basic game theory makes it clear we're far away from the optimum. Of course, game situations dictate a bias toward run or pass in specific games, but overall, the baseline rate should be much more pass heavy. Second, the more and more successful offenses become at moving the ball, the less important field position becomes and the more important possession becomes. When teams punt, they are making a trade-off. They are purchasing field position at the cost of some probability of possession. The easier offenses can advance down field, the less important field position becomes and the more valuable possession becomes. Turnovers of any kind become more costly. Sacks become less damaging because it's easier to make up the ground lost. Going for it on 4th down and occasional onside kicks make more sense every year that offense continues to gain a bigger edge. Teams have yet to truly exploit this shift in the sport. 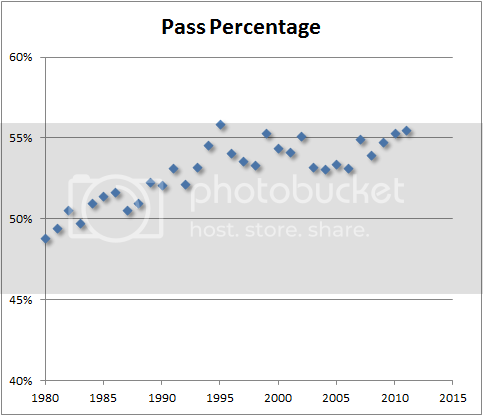 The run pass ratio has barely crept toward more passing over the years. Although the run/pass balance has shifted about two percentage points in the past decade, it's been relatively constant since the mid 1990s. It almost seems like there is a ceiling at 56%. Run/pass balance should be moving toward passing far faster given the relative strength of each play type. There are practical considerations that may mitigate a pass-heavy strategy mix. Coaches don't want to expose their high-priced QBs to injury. There are also arm-fatigue and receiver-fatigue considerations. These are real concerns, but they may be exaggerated. Consider our friends from the Great White North who defy these worries. Due in large part to its three-down format, the CFL's run/pass balance in 2011 was 36/64, much more pass-heavy than the NFL, and no one's arm fell off that I'm aware of. Plus, the CFL plays an 18-game schedule, which means more total passes. There are also strategic arguments for running. Offenses need to run to constrain the defense, keeping linebackers and pass rushers honest, and offenses need to run to set up the play action pass. I have no doubt these arguments are true, but it appears offenses are running far more often than needed to keep defenses on their heels. I think you are not looking at this strategically. Passing plays have always been viewed as offering a better chance at a big gain (which has skewed YPA upward) but running the ball is used to manage the game and run down the clock. Take a look at average clock time run off on a pass play compared to a run play. That's true of course. But that consideration should not affect the majority of the game in which running down the clock is not yet the smart strategic move. Anyone who has kept up with this site for years will know exactly what you're talking about, but some newcomers reading this article might want to see data connecting passing with winning...I'd at least throw in a link to some of your previous research. I would expect the conclusion to be even further strengthened if the effect of penalties were factored in, also. Many punitive things can occur to a defense on a passing play: illegal contact, spot fouls for pass interference, roughing the passer, hits on defenseless receivers, etc. These hidden passing yards do not count towards ANY/A, but they certainly add up. Indeed, many have accused the NFL of trying to legislate pass defense out of existence! Can you explain what you mean by manage the game? A completed pass would run similar amounts of time off the clock as a rushing attempt. The fact is that a good reliable short pass could do all of the above, and that's a lot of what we're seeing. Screens and west coast style passing allow a team to do all of the things above, but more importantly have the threat of the big play that a run up the middle doesn't. As the passing games improve, the advantage of using a run to achieve 1-4 is reduced. In other words, you don't need the run to setup the pass, you need the short pass to setup the long pass. As the short pass becomes more reliable, it has the ability to replace the run as the base of the playbook. My own studies make 2002 as the tipping point. I did a bunch of regression stuff using season-to-date ypr and ypp as the independent vars against points-per-game and there was a big change that year. 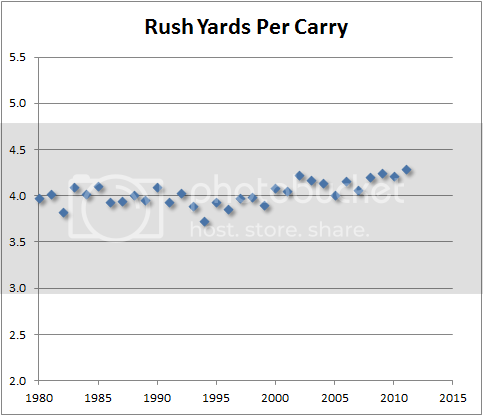 I think you are overlooking the effect of the need for first downs in the game-theoretical run/pass ratio. If the game was simply to accumulate as many yards as possible, then your 15/85 guess might be correct, but since much of the game is only to get 10 yards at a time it is often correct to run even if it produces lower expected yardage. It seems like success rate would be a better metric for analyzing optimal run/pass ratios. I also think that the top offenses in the league (NO, NE, GB) are pretty close to optimal in this regard. Or at least closer than this article would lead you to believe. I agree teams SHOULD pass more, but I don't think the article shows strong evidence that they WILL be. The beginning of the article predicts "an accelerating trend toward more potent and more frequent passing" while the discussion of one of the charts mentions that the run-pass balance has been "relatively constant since the mid-90s," with a ceiling around 56% passing. The data seem to imply that either completion percentage is rising or that average yard per completion is rising, or perhaps both. Would an EPA or WPA analysis correct some of the situational shortcomings of this analysis? For instance, on 3rd and 1, coaches SHOULD rush the ball most of the time, and they do. Previous analyses suggest that coaches actually pass too much on 3rd and 2. So I'm imagining that the mistakes are coming more on 1st and 2nd down. Is there a better way to reconcile these findings? Run/Pass should change, but I think your 15/85 is too extreme. Why? - Marginal costs of passing will increase as base defenses adjust to this new reality with their formation. At this point, some "innovators" will start running. This leads to cutting down on the passing somewhat. - Your argument that running to control the clock is only at end of games misses the point that coaches want to control the number of total possessions. Since football has high variability, you don't want to give the opponents enough chances to take high risk/reward. - We forget that the big guys doing the pass protecting also take a hammering. Running allows them to be the aggressors every once in a while, and they become the punishers, not the punishees. Psychologically and physically I believe this is important as well. - The more efficient you are on offense, the less chances you want to grant your opponets. It's the reverse of the high risk/reward strategy you propose for underdogs. Favorites are favorites because they are more efficient. Hence, they are rewarded for taking lower risks. it has been stated once in the comments but i would also agree that there is hidden yardage in penalties. i bet if this were factored in, the trend up in yards per passing attempt would be even more drastic in the last several years. this won't add up on anyone's receiving or passing stat sheet but offensive coordinators are certainly aware the rules are slanted toward their favor in the pass game. Interesting analysis though I believe rule changes are the primary reason the league is pass happy. As rule changes have made it easier to pass, the teams have adapted. Those adapting and adopting early and often have been more successful. Interesting tangent on this opening day is the disproportionate impact of a top-notch pass rush, ala the Giants. If teams will pass more, a devestating pass rush may be the best defense at the end of the day. 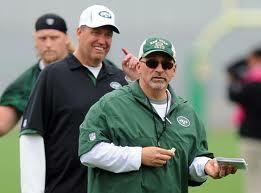 Thank you for showing Tony Sparano in the pic above, since he's a prime example of someone who just. doesn't. get. it. As a Dolphins fan, I couldn't be happier to see him go run the Jets offense, after four years of his risk aversion dooming any chance of the Dolphins winning up to their potential. His low variance running game (other than the 2008 vintage Wildcat) following on Wannstedt's use of the same, has to be a prime reason that they've consistently underperformed their pythagorean expectation. Welcome to Fistpumps-for-Fieldgoals Jets fans. You'll miss Schottenheimer by week 6. As a fan of a run-heavy team, there is no argument here from me. It's plain to see. I'd prefer my team pursued a stronger passing game to take advantage of the disparity here. Game theory would seem to hold that it wouldn't be advantageous to go against the grain until we at least approach that equilibrium, but I wonder, is there room for broader variance in strategy even now? I can think of plenty of logical reasons why the run-heavy physicality approach could yield dividends with an already-noticeable shift in defensive personnel toward defending the pass, but I don't know if that holds up to scrutiny. That is, surely with the continued shift toward the pass and the shift in defensive personnel, the advantage of a balanced or run-heavy approach increases, albeit modestly, but my question is, could there possibly be room to benefit in 2012? Whats the correlation between pass% and winning%? Is the same strategy optimal for all teams? i.e. Does a team with significantly worse ability benefit from using a strategy that increases variance? It takes a good quarterback to exploit a higher pass/run ratio. There's a reason that three of the highest ratios in 2011 belonged to New England, New Orleans, and Green Bay. Telling Tarvaris Jackson to pass more is not going to create a more explosive offense. Brandon - actually, Tarvaris Jackson's AYPA last year was 4.5, while the average yards per carry shown above is 4.3. The offense still might not qualify as explosive, but its an improvement. I understand your analysis, conclusions and the points raised in comments. I can't help feel that the two aspects not properly accounted for are alternate possessions and time remaining. The impact of a turnover on 3nd down seems to be marginally differently than an incomplete pass followed by a punt/return to the same yard-line. Is getting a 1st and 10 at mid-field via a fumble recovery really that different than receiving a punt at the 10 and returning it to the 50? Also the models based on per play efficiency don't take into account the difference in clock time. Incomplete passes don't only fail to gain yardage, they fail to take as much time off the clock. This can have a positive or a impact on winning probability. Sometimes the incremental time used is more important than the chance for yards. I think some time ago I posted a similar comment in a discussion of the value of time outs vs 5 yard penalties for delay of game. I understand game theory, and know where you're coming from, and agree that people should pass a lot more, but I think Adj Net YPA is the wrong metric to check, because of the aforementioned first down problem. Running, as we know, has lower variance in yardage than passing, because nobody can reliably complete more than 70% of their passes. So presumably there is some threshold of down-and-distance after which it becomes better WP and EP-wise to run, despite the lower expected yards, because the probability of first down is higher and therefore WP and EP is higher. So I think if you measure the relative WP and EP instead of the pure expected yards, you will end up with something that still says people should pass a lot more, but by less than expected yards would predict. And, not that this should influence it, people will probably find that a bit less counterintuitive. I also think WP is more useful earlier in each half than you give it credit for, especially as your database grows, since there is still some clock effect in the first and third quarters. I'm going to posit that the equilibrium point is around 60%, but your ratios are never going to approach that because of kneel-downs, burn the clock with the run in the late 4th Q, and the tendency of less explosive teams to run a draw on 3rd & 10+ for field position purposes. SF did this frequently, and they went 13-3 last year. Not all teams are built like the aforementioned Pats, Saints, & Pack. There are teams like the Jets, Ravens, and Steelers [and last year's Niners] who are successful (at winning) with defense, ST, and field position. There are others like CLE, JAX, MIN, & MIA, who don't have a QB who is ready to take on these responsibilities. Those 8 teams will run more than league "optimum", because that's not optimum for THEIR team. Another problem with a 60+% passing ratio is the chance your All-Pro QB gets injured. See Cutler last year, Brady a few years ago, etc. Sure, most of those are random, but the more the QB passes, the more hits he potentially takes (legal & illegal). Most QB's don't EVER get touched on a run play. These reasons are why, IMO, 60% is the equilibrium, and my guess is that you would get the numbers up 1-2% if you removed kneel-downs from your database, and the other 2% to get to 60% if you manually removed any runs by the winning team with less than 3 min. remaining in the 4th Q, and ESP. if the losing team has 1 or 0 time-outs remaining. There may also be the occasional play before the end of the 1st half where the offense runs a running play, then elects not to run another and the defense elects to not use a time out. On all the above plays mentioned, the goal is not to gain yards. PS--Since your own research has shown that Success Rate is a better stat to measure running than just YPC, you might should have mentioned that in the article. As other commenters have mentioned, SR shows why many coaches choose to run in certain situations, when the pure YPP #'s show the reverse. Will we see the NFL prediction model this season? You pointed out that the better offenses get the more important possession is rather than field position. But isn't a pass twice, maybe three times as likely to be a turnover than a running play is? That makes running more lucrative. This effect would be compounded if teams would just go for it more often on fourth down, as the more opportunities you have, the less variance you want. That combined with the fact that running is valuable even in the current environment as a constraint, in short yardage, the red zone, on 3rd down, and to burn clock and I don't believe 15/85 would be the true optimimum. Still, I agree we are not near it and it's going to take some riskier coaches to get a better estimate of what it is. (1) If you don't run the ball it will deny the power of the Play Action Pass. (2) It will increase the % of 3 and outs b/c there will not be as many consistent manageable 3rd downs which runs more reliably set up. (3) Say what you wish, but a good running attack will slow down the pass rush... leading to less sacks. (4) The amount of passes per game have steadily increased due to many shorter passes. These teams are not using the west coast offense but they are using some hybrid version of it, depending on short reliable passing. I would love to see some stats of pass attempts less than 4 or 5 yards year to year. I would be very surprised if it didn't directly correlate with passing attempts per game. (5) If the defense knew you were going to pass 85% of the time (which seems ridiculous) they would more readily be in all out pass rushing mode which would lead to many more sacks & injured QBs. Teams would build their defense around the pass rush to counteract a league shift to all passing. 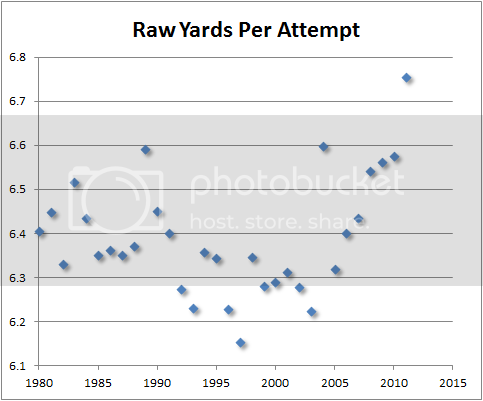 (6) Of course be an upward trend in passing yards per attempt. That trend has a lot more to do with the rules the league has implemented that favor the offense and tell the defensive players to take their hands off the receivers, in turn emasculating the sport. The trend for more passing has increase due to league rules more than anything. (7) Defenses are going to adapt to any offensive game plan. Running the ball will always be a large part of the game as long as the NFL doesn't to continue adding biased rules against defenses. I honestly can't think of one rule that has benefited defenses in the past 15 years... so this very well may happen. great stuff, fascinating to read. I love this site. However, it's pretty obvious this extrapolation of simple stat analysis is wrong. why is it obvious? because it does not happen in reality. if cleveland could just call pass plays 85% of the time, so as to equal yards/run and yards/pass, they won't win any more games. Wrong. There are many reasons that calling more pass plays than the norm does not occur. The number one reason being that the NFL mindset is that of an "old boys club" meaning if you do things differently you are wrong. Coaches are always timid to go against the grain because if they lose every question will be "Why didn't you play 'like you're supposed to'? Everyone 'knows' that's the best. You must want to lose". Look at Bill Belichik's 4th and 2 call against the Colts a few years back. If he had just punted the ball away and the colts had still come down and scored (which they were doing at will on that defense in the second half), no one would have said "terrible call to punt the ball there" because that's the expected play. Being expected doesn't make it right. On the other hand, how do you "know" the Browns wouldn't win more games if they called 85% pass plays? No one has ever done it before, no one has even come close. All we know is that it goes against the "common knowledge" that you "need" to run the ball a set amount to win. However what Brian's data shows is that over the past decade, throwing the ball has become more and more lucrative while running has remained constant. The game theoretic smart play then is to increase the pass:run ratio which is what this article is explaining. How people can not understand this is beyond me. Oh and all the people saying "well running yards are more consistent" are completely wrong. The majority of running backs will average only about 3 yards per run on 90% of their carries, and then break one for 20+ a game to get their average up to 4 ypc. That's not consistent nor is it good enough to compete with safe screen and short yardage throws which can be completed at well over 80% of the time. Plus it's way more common to "break one" for 15-20 yards when its a 1 on 1 match up on the outside then when its 7 vs 7+ in the box. 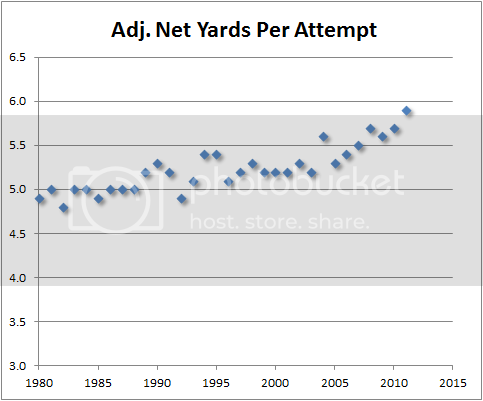 The one issue now is that the value of an interception may be increasing if scoring is becoming easier thus changing the int yardage multiplier in adjusted net yards per attempt. There is one thing in favor of running that has been missed. On a per-play, per-game basis surely the passing % must increase. But coaches have to consider that a QB is a precious asset. They don't grow on trees and they are expensive. RBs are getting (relatively) cheaper all the time. Last I checked the QB rarely gets hit after handing it off to the RB. Throwing risks the career on every snap. QBs age even if you don't use them. But they surely age faster when they are hit. A coach has to weigh the value of the current game against the QB's net present value, or NPV. This implies that older, more marginal QBs who are easily replaced should be used more aggressively than younger and better QBs. As well the value of the remaining QBs on the roster need consideration. You can expose Jim Kelly to some hits when you've got a good backup like Frank Reich around. Good discussion, as anonymous who said 'obviously wrong', let me be very clear. the NFL is a 10 billion $/year business, and they are aware of Microsoft Excel. Winning the superbowl is extremely valuable, and if simply 'passing more' was effective, it would happen. For a real world example, look at Mike Martz, that guy would not have an RB on his final 53 if he could get away with it. His biggest criticism, was he would abandon the run too quickly. The last decade, he hasn't really been that successful, and his worst games are the ones with ~10 run attempts. Another real world example, the broncos last year. Running was very successful for them, and applying this analysis to them would have been very wrong. Obviously passing is important, and that is reflected in the current NFL. But look at completions vs runs (rather than add in all the incomplete passses) and they are much closer to even. My point is that the extrapolation of a statistical analysis is simply not valid. Hell, you could probably show that hail mary passes get TDs more often than the typical passing play, therefore all teams should just throw hail marys every play. Or fake field goals get a first down at a high rate, therefore all teams should fake a field goal on every play. It simply does not work like that. Question: what exactly is the "85% passing" based on? If passing is better than running, why not 100%? Does this maximize winning probability if you run a few million game scenarios? @ Anonymous above - The fact that the Giants kicked the extra point with like 3 minutes to go in the game instead of going for two (FOR CRYING OUT LOUD!!!) shows that your assumption that football folks are aware of basic math is false. Like, the most basic math possible. Like, ever. Eric Moore - Substitute "Max Hall" for Tarvaris Jackson, then. I think you know where I was going. The idea that the Browns would win more games by increasing their pass/run ratio strains common sense in light of their QB situation. Please see every 49ers game last year. How did passing work out for those teams when they failed to run it? Lots of yards...who cares and not enough points. The short pass to setup the long pass? That's retarded..